The terrific gaming magazine Kobold Quarterly — which we featured here just two weeks ago — has ceased publication. The final issue is #23, Fall 2012. It’s a fact that in every fantasy roleplaying game… a kobold’s life is short. They’re wily and quick, but they have few hit points. Sooner or later they go down — fighting. That day has come for Kobold Quarterly magazine. After five years of publication, Shelly and I are closing the doors on the little fanzine that could. And now, as adventurers do, we will gather in the tavern to hoist mugs of ale and talk about the monsters we slew and the treasures we won. And then we will begin planning and scheming for the next adventure. Kobolds might be easy to knock down individually, you see, but they always come in big numbers. The kobold crew will keep serving you with free articles, the free Courier newsletter, Kobold Press adventures and sourcebooks, and other projects. Subscribers are being offered the option of a 150% refund in Kobold Store credit, or a 100% refund via PayPal or paper check. Contributors are being assured that even though the magazine is folding, Kobold Press is still going strong, and articles scheduled to appear in future issues may be picked up for other Kobold Press publications such as the Pathfinder New Paths line, Midgard Adventures, and other new releases. 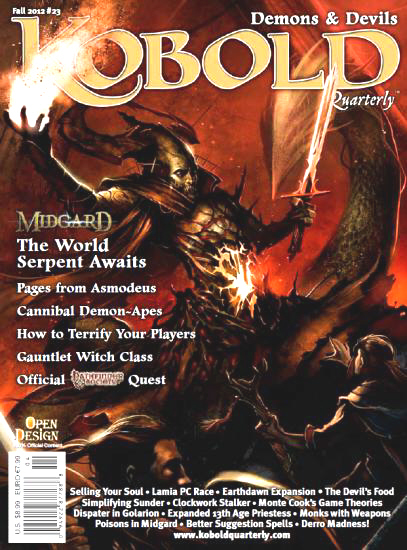 Kobold Press will continue to publish the free Kobold Courier e-newsletter, as well as big commercial releases such as the The New Paths PDFs, Player’s Guides for Midgard, and two top-secret projects in the works for 2013. Read more about the excellent Midgard in Wolfgang’s recent Black Gate post. While we know that the only constant in the gaming industry is change, the loss of Kobold Quarterly is a real blow to the field. It was an excellent magazine that captured the spirit and excitement of the best of the early gaming magazines, and it will be missed.